Digital technology moves fast, and good ideas get stolen all the time. 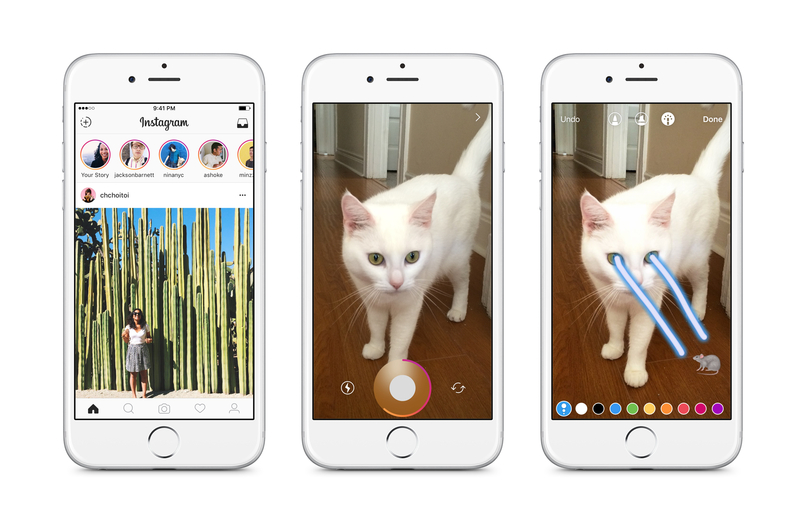 A prominent case of this is the introduction of Instagram Stories in August 2016. Snapchat is being squeezed. And it shows. View counts on Snapchat have dipped by 15-40% since the release of Instagram Stories, and so has the posting volume. Its IPO filing earlier this year also revealed a decline in the growth of new users1. Has Instagram killed Snapchat to become new king of the ephemeral video format? What does Instagram Stories hold for the future of the ephemeral video format, and for businesses worldwide? On both platforms, the average user tends to be female, based in the United States, and young. Snapchat’s average user is just a tad younger than that of Instagram’s, with the average age falling somewhere between 18 to 242, versus 18 to 293 on Instagram. However, this image of the average user obscures important discrepancies between Instagram Stories and Snapchat. These discrepancies have implications for how the two platforms operate, and for businesses who conduct marketing strategies using these platforms. Instagram’s demographic spread is wider than that of Snapchat’s. While users of both platforms tend to be young, there’s a more even spread in age groups on Instagram as opposed to Snapchat. Instagram also has a wider international reach, with 75% of Instagram’s audience hailing from outside the US4. Meanwhile, users of Snapchat remain disproportionately American. While Snapchat’s lack of demographic spread can be construed as a weakness, its generational-specificity may actually be contributing to Snapchat’s user retention. Snapchat is very sticky: the average user visits Snapchat more than 18 times a day5, and spends over 30 minutes in the app6. Combine Snapchat with deals targeting a teenage audience that are highly time-sensitive, you might just have the golden formula for a winning marketing campaign. Taco Bell Knows That Millennials Eat Around The Clock. It Also Knows How To Make Them Hungry In The Middle Of The Night. While Instagram Stories boasts over 250 million daily active users, its real strength lies in the 400 million daily active users7on Instagram. That’s 150 million users that haven’t converted – who have a high chance of converting, since Instagram Stories is displayed prominently at the very top of the app. Snapchat, on the other hand, isn’t plugged into a pre-existing social network. But this doesn’t mean that marketers should be quick to dismiss Snapchat as a potential marketing platform. Snapchat still boasts an impressive 166 million daily active users8, many of whom are highly engaged users that regularly create content9. Perhaps the clearest sign that Instagram hasn’t killed off Snapchat yet, is that the launch of Stories hasn’t led to an En Masseflocking of Snapchat users over to Instagram. Snapchat’s user base is still growing, albeit at a slower pace. By Copying Snapchat, Instagram Stories Has Amassed The Same Number Of Users As Snapchat Has – All In A Matter Of Months. But Are Users As Loyal To Instagram Stories As They Are To Snapchat? That’s Another Question. For marketers, it’s all about the data. And Instagram is sister company to one of the largest data mines on earth – Facebook. Instagram is therefore able to encourage browsing by matching users with suggested content based upon their digital activity on Instagram and Facebook. Advertisers can place ads on both platforms using the centralised Facebook Power Editor tool. For businesses, this means easier access to target audiences. And this is where Snapchat loses out: While the community integration function on Instagram is strong, it’s much harder to find your friends on Snapchat, much less strangers and businesses who have had no prior contact with you. But things may be about to change: Snapchat’s latest update allows mutual friends to find each other on a map in real time. This could help individuals widen their social circle, and even help companies connect with their potential customers. Ingenious feature, or fodder for cyberstalkers? In the world of ephemeral videos, the rule used to be that once it’s gone, it’s gone. But Instagram has worked around the 24-hour time limit by introducing deep-linking capabilities into Stories. Business account users can link apps or web pages to a story, allowing others to access them with a ‘swipe up’ motion. This is a good strategy for fostering a sense of urgency, and pushing users to take action immediately. In a slightly ironic twist, Snapchat seems to have taken the cue from Instagram and introduced the exact same feature in January this year to business advertisers. While this feature has been around on Snapchat since 2015, it was only available to an exclusive number of verified publishers. Just another sign that Snapchat is feeling the heat. Swipe Up Before It Disappears! Both Snapchat and Instagram Stories allow post-roll ads. In terms of their efficacy, one agency shared that, for one particular campaign, the Instagram ads costed much less than Snapchat ads – specifically, $4 CPM (price per 1,000 impressions) as opposed to $8.50 CPM. There appears to be a difference in engagement levels too: 4.5% on Instagram who saw the ad watched it to the end, versus 3.5% on Snapchat10. These findings are not too surprising. After all, Snapchat has always been used as a platform for connecting with intimate friends. Who’d want to watch third-party ads in an app that is so commonly used for sharing ugly selfies, compromising videos, and the like? On Snapchat, there is a greater range of ads available. There’s a Discover section that doesn’t interfere with users’ viewing of stories, where selected brands can place their video content. Brands can also pay for sponsored AI lenses. The catch with both of these options is that they don’t come cheap. A Discover ad starts at $50,000 per day, down from the $750,000 Snapchat used to charge11. Taco Bell’s Cinco De Mayo Snapchat Filter Set It Back $750,000, But Was Reportedly Viewed 224 Million Times In Just One Day. On Instagram, mass advertising is not only permitted, but also encouraged and optimized for advertisers. By advertising on Instagram, businesses can opt into a performance tracking feature that gives them a better understanding of their viewers. While advertising on Snapchat is still not an option for smaller companies, the social media platform has recently began to build an ads API – owing to competition from Instagram, and perhaps grudging recognition on boss Evan Spiegel’s part that putting user data to good use is the only way to bring in good money12. For now, Snapchat is still not the most advertiser-friendly app: It doesn’t allow users to switch between personal and business accounts without logging in and out (unlike Instagram), and it doesn’t have sophisticated analytic features (also unlike Instagram). While Snapchat Still Doesn’t Have Mass Advertising Functions, That Doesn’t Mean That It Lacks For Strategic Marketing Foresight. Case In Point: Snapchat Is Partnering With Uber To Penetrate The Indian Market. Brands like Red Bull, Spotify, and Dunkin Donuts have already launched marketing campaigns on Periscope, Twitter’s live streaming app. Why not do it at Instagram next? Meanwhile, Snapchat is still languishing in this area. While video chat is supported on Snapchat, it’s a strictly one-on-one affair that makes it more interpersonal than social. It wouldn’t be long before marketers catch on to live videos as a fun and low-fi way of raising brand awareness. We don’t know where Instagram will take us next. But one thing is for certain: with the convergence of features and competitive strengths, competition between the key social media giants will only be getting stiffer. Instagram is keen on moving past the stage of being perceived as a Snapchat clone. And it’s also changing the ephemeral video format we used to know fundamentally. While the ephemeral video format used to be valued for its ability to keep things simple, casual and raw, the litany of new features and mass advertising capabilities that Instagram introduced to its Stories means that users have to guard their behaviour more closely. With Instagram Stories squeezing Snapchat’s market, one way forward for Snapchat is to expand its audience group by getting older people onboard – just like what Facebook did previously. But since one of the main selling points of Snapchat is its generational appeal, it’s not clear if this strategy would float with the current audience group. Afterall, teens favor Snapchat over Facebook because their moms and pops are not there. On the other hand, first generation Snapchat users are also growing up. It’d be interesting to see how Snapchat evolves when their users become moms and dads themselves. The biggest concern for Snapchat users used to be that people would take screenshots of compromising snaps. But there appears to be bigger concerns now – in the form of pesky ads. 9. Ultimately, is it fair to pit Instagram Stories against Snapchat? So far, we’ve proceeded on the premise that Instagram Stories and Snapchat are comparable. Features-wise, they are indeed similar. But are they similar in principle? One might say that the two differ fundamentally in user-purpose and user-experience. While Instagram users may pay more attention to follower-count and the number of likes they get for each post, Snapchat users may be looking for a more spontaneous and intimate experience on Snapchat. The same teen girl who follows multiple social media influencers on Instagram may have a much more limited but highly engaged audience on Snapchat. These differences have important implications for marketers as well. While advertisements on Instagram have become ubiquitous, advertisements on Snapchat are more likely to be perceived as an unwelcome presence. But this need not be the case across the board. Marketers can always find ways to tap into the intimate and personal nature of interaction on Snapchat. As always is the case with advertising, it’s a delicate balancing game between attracting the attention of prospective customers, without being obnoxious and intrusive.